"Child development" has always been a traditional component of well- child care and a particular area of interest for pediatricians, child neu- rologists, and psychologists. 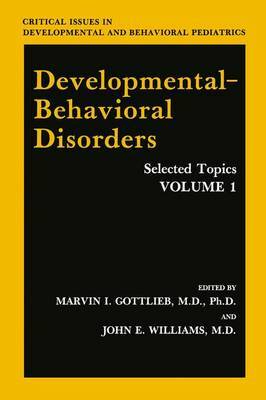 However, it was not until the early 1960s that children with developmental disabilities (i. e. , chronic handicapping disorders) became a major focus of public and professional attention. During this period, children with "special needs" were dramatically catapulted into the limelight and "exceptional" became the buzzword of the day. Public and professional awareness of these issues reached new peaks and recognition of the potential psychosocial impairments of chil- dren with developmental disabilities created national anxiety. A variety of factors contributed to an unprecedented societal advocacy for chil- dren with developmental problems: (1) a national concern generated by President Kennedy'S particular interest in mental retardation; (2) in- creased activity and visibility of parent advocacy/lobbying groups (e. g. , the Association for Children with Learning Disabilities); (3) the enact- ment of federal legislation designed to protect the rights of the handi- capped (e. g. , PL94-142); and (4) the popularization of developmental- behavioral disabilities by the various communications media. Cumulatively these events precipitated a redefinition of the real mean- ing of "comprehensive health care for children," resulting in an empha- sis on the child's neurodevelopmental, educational, psychological, and social needs. For the pediatrician, a myriad of new management respon- sibilities were mandated, in addition to the traditional health care con- cerns.